The Elias String Quartet is known for intense and vibrant performances, the Navarra String Quartet for dynamism and poetry. 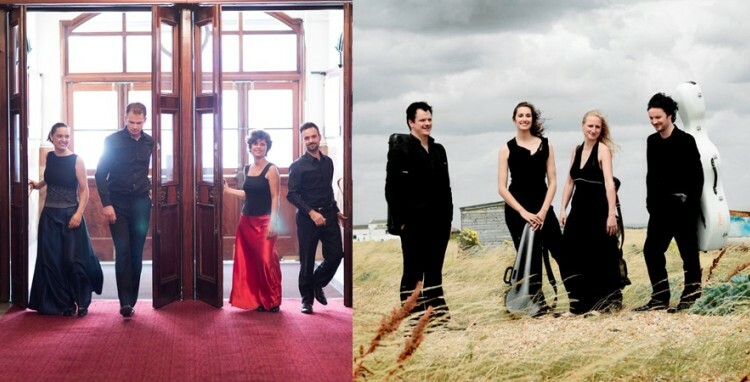 Both quartets were formed at the Royal Northern College of Music under the guidance of Dr Chris Rowland and both continue to enjoy international reputations and collaborate with some of the finest musicians around. They also enjoy collaborating with each other! The Navarra will play Schubert’s D804 Quartet, the second movement based on a theme from the incidental music for the play ‘Rosamunde’. The Elias have chosen to play a piece written for them by Sally Beamish which evokes the vastness of both the Outer Hebrides and the Norfolk fenlands. Finally the two quartets combine to perform Mendelssohn’s youthful Octet, its verve and brilliance making an exhilarating end to the evening. 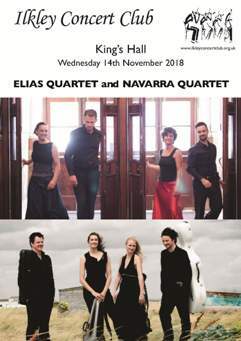 It is a rare and exciting prospect to have two quartets performing at the same concert, as was shown by the full house which attended last Wednesday at the Kings Hall. The highlight was the second-half performance of Mendelssohn’s youthful Octet by the combined forces of the Elias and Navarra quartets. This was a tour de force of string playing, combining, as Mendelssohn requested, the dynamic range of massed orchestral strings with the subtle interplay between equals characteristic of chamber music. It is always a delight to witness the smiling interactions between quartet members as they play, doubly so with this octet. Sara Bitlloch of the Elias led the group with great assurance in the virtuosic first violin part and the other players responded with marvellous impetuosity in the opening Allegro, tender sweetness in the following Andante, lightness of touch in the Scherzo and full-blooded enthusiasm in the final Presto. This memorable performance fully justified the prolonged and thunderous applause it gained from the Ilkley audience! Before the interval each quartet was able to showcase its talents. The Navarra gave an interesting and enjoyable rendering of Schubert’s ‘Rosamunde’ quartet demonstrating wonderful dynamic extremes. The use of hesitation in introducing some themes to create tension was effective but became a little too studied on repetition; nor was the balance always perfect, unsurprising perhaps in a group working with a relatively new viola player. The surprise of the evening was Sally Beamish’s third quartet, given an enthralling performance by the Elias quartet. Written for the group in 2011, ‘Reed Stanzas’ highlights Donald Grant’s other career as a Scottish fiddle player by beginning and ending with a lament played solo, the player processing through the audience. The others join in, playing often in their highest registers, with recognisable bird calls emerging from the texture. A central agitato leads to Donald breaking into a jig, before the music subsides into the lament. This was an utterly persuasive piece of virtuoso music-making offering Concert Club members an unique soundscape, to which they responded with warm appreciation. This beautiful quartet is superbly performed by the Takács Quartet on Hyperion CDA 67585 (full price). The coupling is the “Death & the Maiden” Quartet, and the recording quality is superb. Few Quartets have played Schubert as well as the Quartetto Italiano, and they perform the last 4 Quartets on Decca 446 1632 (2 CDs at budget price). The natural sounding recording of Quartet No. 13 was made in January 1976, but has been transferred to CD to a high standard. No commercial recording of the piece exists at this stage, but perhaps the Elias Quartet could oblige at some time in the future. Mendelssohn The fine violinist James Ehnes is included in the Seattle Chamber Music Octet in an excellent recording on Onyx ONYX 4060 (full price).. The coupling is a very good performance of the Mendelssohn Violin Concerto, with the Philharmonia conducted by Vladimir Ashkenazy, and James Ehnes as the soloist. An equally recommendable disc has the Kodály and Auer Quartets from Naxos 8.557270 (medium price). The recording is well balanced, and the interesting coupling is the Max Bruch Octet, one of his last compositions.